POINT PLEASANT, W.Va. — Off and running. The 2017 high school football season officially kicked off on Friday night as all three Mason County teams opened the year with tough tests at home, which included the end of an incredible streak. Mingo Central connected on a Hail Mary pass with six seconds left in regulation, which allowed the defending Class AA champion Miners to end Point Pleasant’s 43-game regular season winning streak with a thrilling 36-34 decision at Ohio Valley Bank Track and Field. The Miners led 22-21 at the half, but the Big Blacks rallied back to secure their first lead of the night at 28-22 a minute into the fourth. Both teams traded leads three more times over the course of the final 11 minutes, including the winning 30-yard score as time expired. 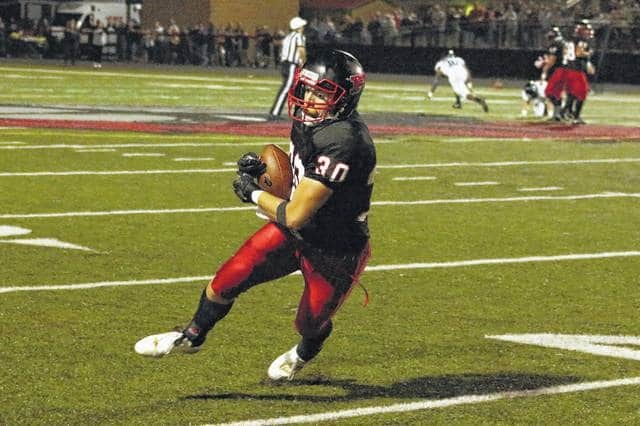 Point Pleasant hadn’t lost a regular season game since the tail end of the 2012 campaign. Both Wahama and Hannan had yet to reach final scores as of deadline Friday night. The White Falcons hosted Ravenswood and the Wildcats hosted Montcalm. Due to an early deadline, the Mason County football openers from Week 1 will be available in full detail in the Tuesday sports edition of the Point Pleasant Register. Game stories will be available online at mydailyregister.com before appearing in print. Point Pleasant senior Alec Smith (30) hauls in a pass that results in a late fourth quarter touchdown during Friday night’s season opener against Mingo Central at OVB Field in Point Pleasant, W.Va.
https://www.mydailytribune.com/wp-content/uploads/sites/42/2017/08/web1_8.26-PP-Smith-1.jpgPoint Pleasant senior Alec Smith (30) hauls in a pass that results in a late fourth quarter touchdown during Friday night’s season opener against Mingo Central at OVB Field in Point Pleasant, W.Va.